My current goal, is a procedurally generated planet. Following the Spore technique, I made a cube out of 6 planes, projected grayscale stencils over them, and used the generated textures, as heightmaps for each face. then, spheriphy everything. The only problem is, there are huge seams on every face border. I do not have access to my code at the moment, but I'll provide it as soon as somebody is interested in helping me thinking this out. I'm just curious if there is a missing part (and how to accomplish it) to average vertices on the edges of my 6 faces (and to make them match in height/distance from center) Thank you all, and have a good day. I hope this shows the behaviour i'm experimenting, without having to paste/translate my hottibly confused code. as you may see, the magenta rays, casted from border vertices, don't always hit (i cast them inward and outward, from the center of the sphere. where pixelHeight is controlled by my grayscale map reading function. Just one more note: Instead of spherify a cube(precisely 6 planes) during runtime (which i found rather slow and useless) I actually spherified the plane in my modeling application, may this make some vertex non uniformely spaced ? thank you, hope to get some feedback, since this is turning out really stimulating for learning. Are you trying to stitch them together in your modelling program? Or are you actually changing the vertex location within Unity? I'm trying to stitch them within unity, since the only thing i did in my modelling program was subdividing conveniently a plane. I'm a bit confused. Are you talking about the solarsystem representation ofa planet or about the close-up, "surface"-view? They are very different in Spore. Also have you and links about the technique used in Spore? I guess you mean the "surface view" and each "plane" is a part of a spherical segment ? Yes, I'm actually talking about a surface generation. I'm following this procedure http://www.nullpointer.co.uk/content/procedural-planets/ the only difference is that I rendered 6 textures, one on each plane, instead of a cubemap, and then mapped them on planes before spheriphying the planet. just noticed your answer was moved, and my reply to that disappeared. The important thing is that you normalize the original vertex position without the heightmap information. Otherwise the two vertices will be at a different spot since each heightmap is extruded into a different direction. When doing this your seem-vertices will be exactly on top of each other, so a ray through them will go through the center point. Now that you have calculated the new-grid position in "sphere coordinates" you just add the heightmap information to your sphere radius when you multiply the vector. To avoid gaps, the heightmap value at the seems should be identical on both (or on all three) touching edges. This vector has to be multiplied with your desired sphere radius + the sampled heightmap information for this point. The resulting vector is the new vertex position. At the seams you would grab the value for both (or at the corners all three) touching planes and take the mean. Thanks, that's exactly what I was thinking about. My only doubt: are seams going to be "flat" this way ? It's still unclear how to average vertices on the borders, if you have any pseudocode (and enough time/interest) I'd be very grateful. i'm gonna give it a try soon, thanks again ! Well, how do you generate the heightmaps? They don't need to be "flat" at the seams (so it doesn't have to be a height value of 0). They just need the same value. The simplest way is to take the arithmetic mean for two points, one from the each terrain. Just add them up and divide by 2. I generate heightmaps projecting random grayscale brushes on a temporary sphere (pretty much the same radius as the normalized planes) at runtime. then for each face of the cube, apply the heightmap. So basically I need to rewrite this part, making it "detect" edges, and average them... Still unclear HOW :) but i'm thinking about it. Thank you very much, again, for the insight. hm although your explaination was quite simple, and you precisely hit the spot, I can't manage to get it to work. If you'd like, i can show you my code, so if you have time, you can address me even more precisely. Thank you again for your help, and have a good day, sir. The spherification method works fine, but i still have some issues on stitching border vertices: i tried writing a function to parse throught them, and casting a ray to the center and to the outside, hoping the hit.point would be the destination vertex to stitch with, but here behaviour is quite strange and unexpectable: some vertices display such lines, while most of them not. at the Red point, take the average of the three values. at the Yellow points, take the midvalue of the two values. along the three green lines. simply add a linear function to bring the value at the red end to the red value. So each white square now has two green "target lines"
So that'a all there is to it. Finally -- very carefully arrange to run MNK() eight times for the eight points of the cube. rotate the top of the cube four times for the four runs involving the top of the cube. Same for the bottom four runs. Using this trick, MNK() only has to deal with the one combination of orientations. write a convenience function for the green lines: given a number N, simply return the value at the pixel which is N pixels along from the red end. If I understand correctly, you are taking a sphere into 6 segments, sliced like a cube, and projecting a gray heightmap on each, and the problem is at the borders of those heightmaps? Why not average the gray pixels along the borders? If each corresponding border has the same values they should match up pretty well I would think. But I've never tried this type of thing with spheres. You could also look into using Terrains and get a terrain stitcher from the Asset store. If the top segment duplicated the top edge vertices of the left/right/front/back segments (and similarly for the bottom segment duplicating the corresponding lower edges of those other segments), and then just one edge of each top/right/back/left edge would need to duplicate the vertices of its neighbor, that might work too. Dave - I assume, like you, that making heightmaps meet is a matter of smearing them, averaging them in. regarding annoyingly making three, not two, square images average together. I have presented a relatively trivial approach for so doing in the answer below. Regarding not the heightmaps but the vertices - as I understand it BUNN has already done the manly job of coding up "transforming from 6 planes to 1 sphere ..... WITH A SLIDER" -- it can be seen in his incredible WEB APP in the link. how to smear six squares in to one sphere. Production note at this stage for unit testing, do just the first four above, and see results on screen. 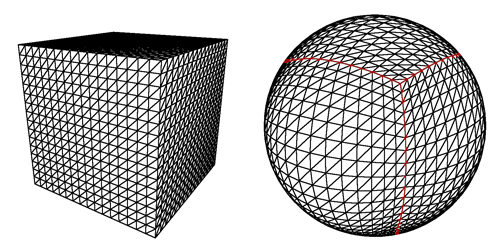 the heightmaps should mate around the girdle of the sphere for the four sides. this checks that the LRS is working fine. of course the top and bottom will meet the four sides in a mess. now they will all meet, other than the last inch of the ones that were done early in the cycle because those would have been disturbed buy the later ones pointing the other way around that corner. [footnote] acute readers will notice that ID is the only place we utilise two dimensional distance, so in fact that innocent line of code is the platonic heart of the "two ways how???!" smearing problem. Point (0) because each "last run of pixels" now all end at 0.625 on both ends.... so imagine we are about to smear a NS edge using LRS(). the top and bottom of that NS line (first and last pixels) are indeed 0.625. say you smear inwards two inches on each side (ie, when you run horizontally, we penetrate two inches on either side, let's say). so, when you do the first or final line, in fact, it will, indeed, already meet (indeed at 0.625) so actually nothing, whatsoever, will happen with the first and last (top and bottom) two-inch runs. (the next runs in will be slightly adjusted, and ever more so as you move more inwards from the top and bottom.) So now, one can go ahead and run points (+) 1, 2, 3, 4 above. they will sort of "magically" mesh perfectly at the corners, due to points -2, -1 here. Now that's all very well, I've realised there's a more elegant way (but not KISS) to do it. I believe the above is the KISS solution. Note that, of course, instead of using "0.625" simply find the average of all twenty-four corner pixels of the six square images, and use that instead of 0.625.
same, for newTb, add a line so it runs from newT to newB. by "add a line" I mean literally add a mathematical line slope x distance, so add "0" to the first pixel increasing linearly to the max delta so that the end becomes the new desired value. notice all six halfEdgeLines have a Beginning and an End. all six Ends are simply the one point in the middle. Using HELValueGrabber three times, simply get the average of that point. Let's say it is 0.24715. (Point 1) so to recap. in the diagram A B C, in fact the halfEdgeLines 1 2 3 4 5 6 are now DONE, they have the final grey values they will ever have. So what the hell does MODQUARTER do? Look at the next small diagram of the Quarter in question. Take any point P inside the Quarter. You don't have to do the edges (5 and 4) as they are done. Get the distance DDDDD of P from the home corner at the top right. If DDDDD is bigger than the length of 5/4, forget about P and do nothing to that pixel. Get the pixel, on line 5, distance DDDDD away from the home point. get GrayDelt, the delta between the grey there and at P.
Now do the same thing ....... going the other way towards 4. Now unit test and you will see the top half of the sphere mate smoothly and beautifully. Again ... the alternative to all this spinning, is, you would have to write an absurdly complicated DoThisPointySection routine that has arguments along the lines of ... DoThisPointySection( A, which quarter, B, which quarter, C, which quarter ) rather than our elegant DoThisPointySection( A B C ). I have deleted this very long comment, as I typed out my KISS SUGGESTED METHOD in the answer. i must say that i really need to read again the whole thing, because it just went over and over above my head. If i got this one correctly, are you suggesting a "numeric" criteria to find matching vertices on faces ? that may be feasable, since my plane is instanced, and rotated via script, so basically i can keep track of a face position/rotation, but still, i have no clue on implementing it. as soon as i have some spare time, i'll try to progress. thank you ! I'm actually on something similar to your first method ;) I made a coordinate wrapper (actually 3, sure you could stack one 3 times but it's bad for performance ;) ). I wanted a method which allows you to address any position on the sphere including it's neighbors out-of-the-box. So for every plane i have a "virtual space" which goes across the planes own borders and map to the correct coordinates on the neighbor plane. I directly address the vertices of the meshes. Couldn't find a good solution for returning the right plane and vertex index at the same time. ok i posted a dramatically simplified explanation of method2 !! Although i've read you reply (many times) i realized never thanked you, Fattie, for putting so much effort in such an explaination which is, sadly, a bit beyond my math/programming skills. but anyway, of course was an inspiration for the method i'm showing. Just after the extrusion phase of the heightmap, i fill up 4 arrays for each cube face, one for each edge. now, cube_faces used as transform.TransformPoint origin, yelds the correct results for all the faces, except the top and the bottom one, but we'll deal with that later. And this way, by trial and errors, i managed to make terrains stitch together. but when i try to apply the same technique to the top or bottom slice, it's somehow unpredictably computing the mids, wrongly. I guess it's something to do with the "transform.TransformPoint"
part of the procedure. i made a debug function instantiate spheres on: each seam vertex, plus one in the average position, and while the first two of them are correctly following the vertices positions along the chosen edge, the average is in an unpredictable position. Thank you guys for your time and inputs ! essentially I've only ever done me' own normals in non-trivial cases. I'm not sure if the unity routine is even in the ballpark of giving a reasonable result here? Perhaps @Bunn has an answer on that one? Should recalculateNormals give an even reasonable result in a case like this? Now is it correct that you are able to do the front-right join .. is that right? But you're having trouble with the say front-top join ? Hello ! Yes, i do have problems everytime i want to join a section, with the upper one or the lower one. I'm quite sure it's something I did wrong with the TransformPoint/InverseTransformPoint procedure, which works fine for front/back and left/right, but doesn't apply to the top bottom face. Thanks !